Many people were involved in the creation of rock’n’roll, but there’s a good case that one man was more important than anyone else. 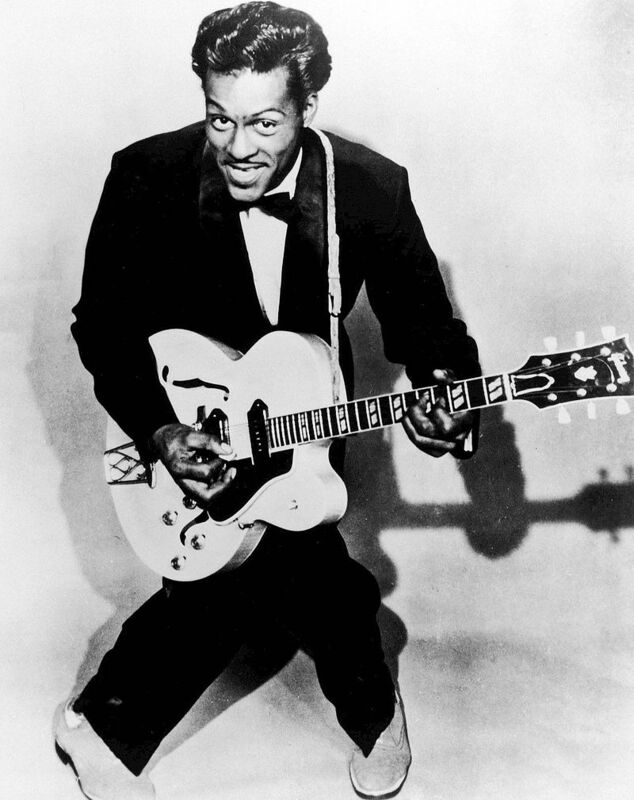 His name was Chuck Berry and he has just died at the age of ninety. He didn’t make a lot of money during that long life, but he influenced a lot of people and brought pleasure to even more. Even those who don’t know his name and have never heard a note of his music could be called Chuck Berry fans, because his songs and his style were the foundation on which bands like the Beatles and the Rolling Stones built their own careers. He was born in 1926 to a poor black family in in St. Louis, a big city in the southern American state of Missouri. Later in life, he would say that his childhood wasn’t a happy one: his parents eventually divorced and he had to struggle to survive. That’s from “Johnny B. Goode”, which has been covered by countless other bands down the decades. It was full of life and energy, embodying the optimism and endless possibility felt by American teenagers in the 1950s and ’60s. Although he was well into his twenties by the time his career took off, Berry understood what young folk felt and liked. They wanted exciting new music for their energetic new lives. Berry supplied it with classics like “Roll Over Beethoven”, “Too Much Monkey Business”, “Rock’n’Roll Music”, “Sweet Little Sixteen”, “Back in the USA”, “No Particular Place to Go”, and “The Promised Land”. But they weren’t classics in those days: they were the freshest sounds around. They still sound fresh today, even though the teenagers they delighted back then are in their seventies and eighties by now. Berry delighted them on stage too: he couldn’t just write great songs, he could perform them with style and charisma. But his success didn’t make life any easier: after being jailed for three years at the age of eighteen for robbery, he might have hoped that he’d never see the inside of a prison again. If so, those hopes weren’t realized. He was a famous musician in 1960, but he was arrested for “taking an under-aged girl across a state line” to work in a night-club he owned. He said he’d thought she was twenty and that she only complained to the police when he fired her. It didn’t do any good: he went back inside for another three years. He practised hard behind bars and when he got out his playing and singing were as good as ever. But his music wasn’t fresh and new any more: from then on, he would be an influence, not an innovator. New stars were honing their craft across the Atlantic in Liverpool and London. When the Beatles and Rolling Stones came to America, you could say that they were taking Chuck Berry back home. From John Lennon to Keith Richard, they all acknowledged how important the American master had been in shaping and inspiring their own music. Indeed, John Lennon would later lift part of Berry’s “You Can’t Catch Me” wholesale for his own song “Come Together”. Berry was on the right side of the law this time and won a settlement against Lennon. But the settlement was amicable: Lennon hadn’t lifted the tune because he held Berry in low esteem. Quite the reverse! But Berry would never enjoy the huge material success of those he inspired. Only one of his songs ever made it to number one, a throw-away number called “My Dingaling”, and he continued to tour for so long not just from the joy of performing but from financial necessity too. He would have more trouble with the law along the way, but nothing would ever shake his importance in the history of rock’n’roll. He was there at the beginning and many people would say he was the best. The King is dead – long live the King’s music!